Russian forces fighting Islamist insurgents in the North Caucasus say they have blockaded two groups of rebels in Dagestan, killing 14 of them. Nine died when security forces launched a "special operation" in the town of Kaspiysk, and five died in another operation in Makhachkala, they said. At least 11 members of the security forces have died in militant attacks in the mainly Muslim region this month. 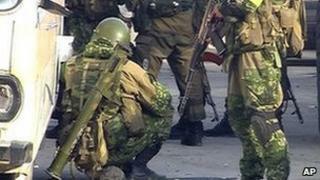 A top Kremlin official said there was no alternative to killing terrorists. "There are no other ways around it but to kill," said Deputy Prime Minister Alexander Khloponin, who is the presidential representative in the North Caucasus. "No other country in the world has dealt with terrorists differently," he told the upper chamber of parliament, the Federation Council, in Moscow. Mr Khloponin, who has been tipped to replace sacked Moscow Mayor Yuri Luzhkov, said he would take up the post if asked to do so by President Dmitry Medvedev. But he added that he was "busy enough already". No members of the security forces were hurt during Wednesday morning's operations in Dagestan, Russia's National Anti-Terrorist Committee (Nak) said. Acting on intelligence from the Federal Security Service (FSB), security units surrounded the two groups of militants at private addresses at 0630 (0230 GMT). "They offered armed resistance when urged to surrender," the Nak said. According to Russia's Itar-Tass news agency, the operations mark the biggest success for counter-terrorist operations in the North Caucasus in September. Two anti-terrorist police commanders and at least four other police officers, as well as five Russian soldiers, were killed in Dagestan in separate attacks this month. Just days before the latest operations against the rebels, security forces reported killing a rebel leader and three of his fighters in Makhachkala. Islamist insurgents have been mounting sporadic attacks on the Russian authorities in Dagestan and other regions of the mainly Muslim North Caucasus for years. With the gradual pacification of Chechnya, where Moscow has fought two bloody wars with separatists since the fall of the USSR, insurgents have concentrated their operations in Dagestan and Ingushetia.